Do you have a dream? A fantastic plan? A seemingly impossible goal? but you can’t seem to move forward to achieve it? Could fear be holding you back? 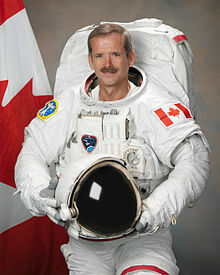 Do you know who I mean by Chris Hadfield? He is the Canadian astronaut who became very well-known when he went into space in 2013. He sent images back to Earth and communicated with thousands of people through tweets from Space. You can read about him here. He is a man of many talents. Here is a very interesting talk by Chris Hadfield, spoken in his funny and calm way. I’m sure you will enjoy it. He talks about mastering fear, and about when he went blind in space. Literally in space during a space walk! So … what scares you? Do you have a dream? What’s holding you back? This entry was posted in Miscellanea and tagged Canadian astronaut, Chris Hadfield, fear, going blind, space walk, TED talk, tweets from Space, what are you afraid of?. Bookmark the permalink.